and Dental Sciences, Niigata University, Niigata, Japan. Received September 30th, 2010; revised December 22nd, 2010; accepted December 26th, 2010.
stress, but the underlining mechanism needs further clarification. 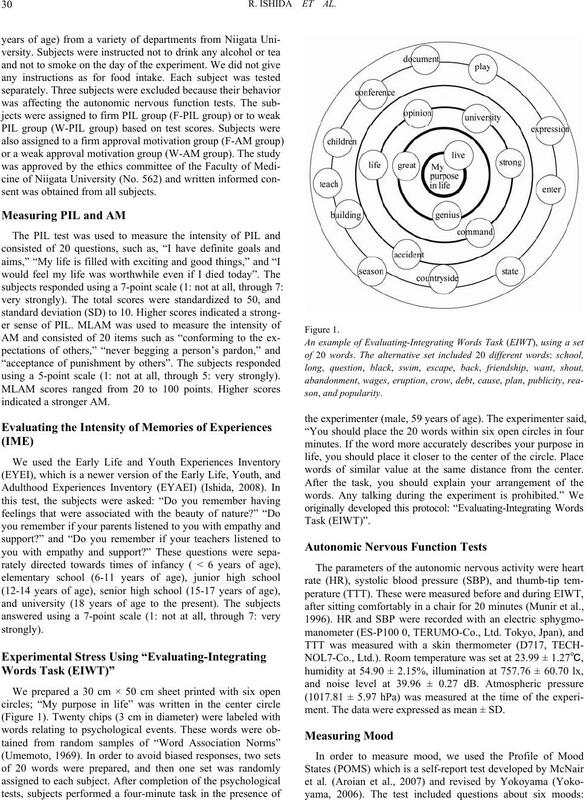 integrate psychological events wit h less confusion (Ishida, 2008). task than persons with less need for approval (Ishida, 2008). measure responses to these scenarios. sent was obtained from all subjects. using a 5-point scale (1: not at all, through 5: very strongly). indicated a st ronger AM. words of similar value at the same distance from the center. ment. The data were expressed as mean ± SD. scores for each subscale were 50 and 10 points, respectively. 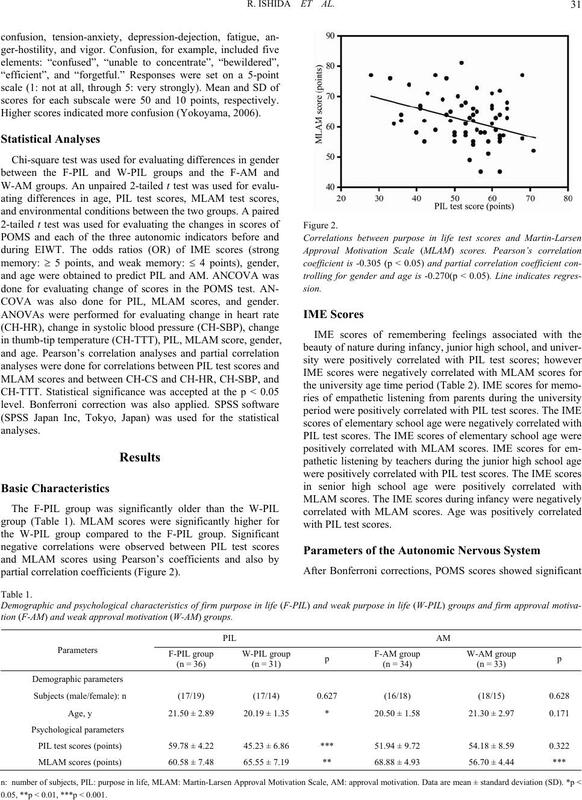 Higher scores indicated more confusion (Yokoyama, 2006). COVA was also done for PIL, MLAM scores, and gender. partial correlation coefficients (Figure 2). 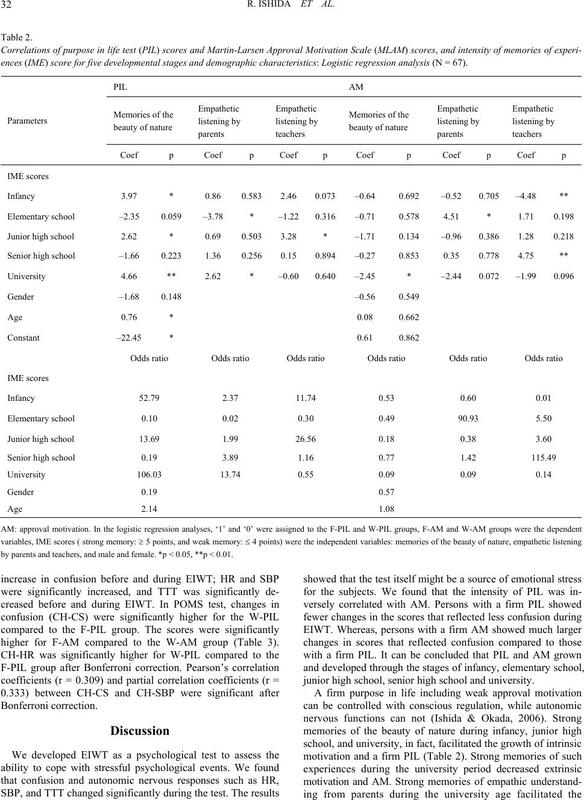 tion (F-AM) and weak approval motivation (W-AM) groups. 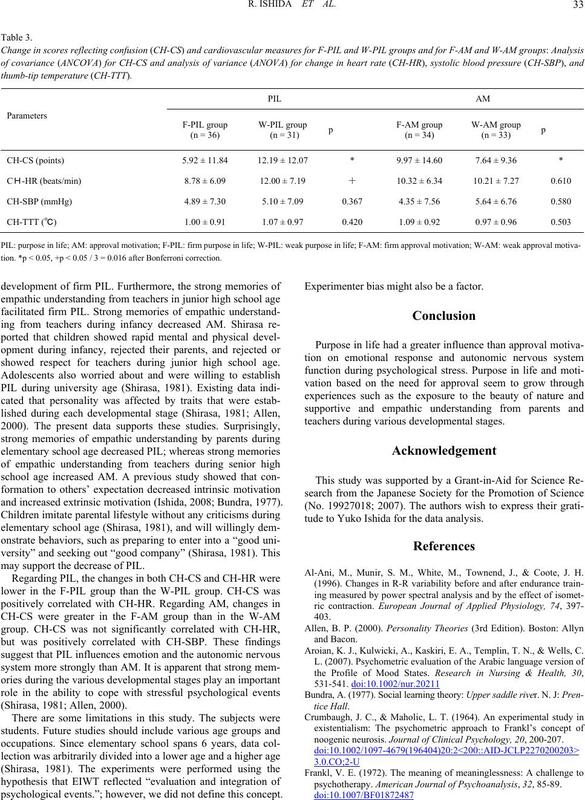 0.05, **p < 0.01, ***p < 0.001.
ences (IME) score for five developmental sta ges and demographic characteristics: Logistic re g r e s s i o n a nalysis (N = 67). by parents a nd teachers, and male and female. *p < 0.05, **p < 0.01.
higher for F-AM compared to the W-AM group (Table 3). junior high school, senior high school and university. tion. *p < 0.05, +p < 0 .05 / 3 = 0. 0 16 after Bonferroni c orrection. showed respect for teachers during junior high school age. and increased extrinsic motivation (Ishida, 2008; Bundra, 1977). may support the decrease of PIL. psychological events.”; however, we did not define this concept. Experimenter bias might also be a factor. teachers during various developmental stages. tude to Yuko Ishida for the data analysis. Al-Ani, M., Munir, S. M., White, M., Townend, J., & Coote, J. H.
Aroian, K. J., Kulwick i, A., Kaskiri, E. A., Te mplin, T. N., & Wells, C.
noogenic neurosis. Journal o f C l in i c al Psychology, 20, 200-207.
psychotherapy. 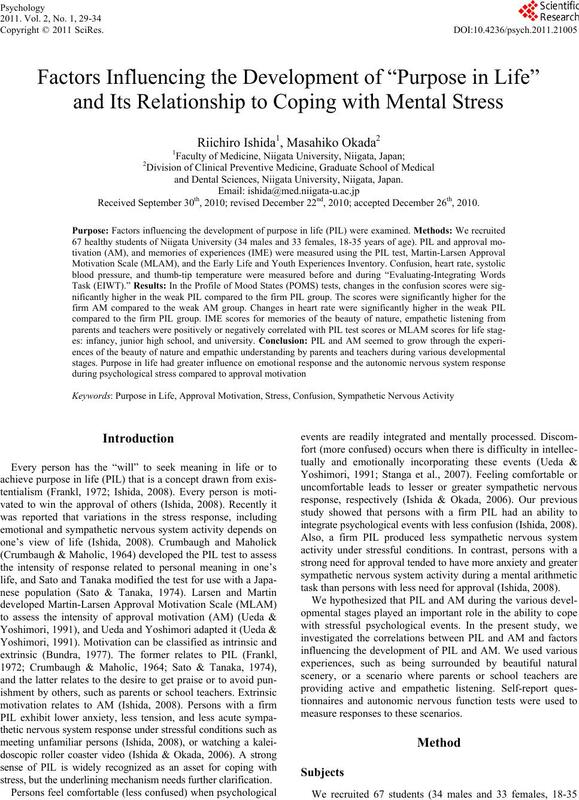 American Journal of Psychoanalys is, 32, 85-89.
aspect of life: Part Ⅰ. Tohoku Psychologica Folia, 33, 20- 46. Stanga, Z., Field, J., Iff, S., Stucki, A., Lobo, D. N., & Allison, S. P.
nourished patients. Clinical Nutrition, 26, 379-382. Yokoyama, K. (2006). POMS short form. To kyo: Kaneko-Shobo.